We manage and report on over $13 billion in property taxes each year. Active relationships spanning approximately 26,000 taxing entities across all U.S. territories, built-in data and regulatory information, and proven business logic within the NTS platform form the foundation of our portfolio of tax solutions. We know real estate taxes. Our proprietary NTS Platform is highly scalable, operates on real-time data and ensures you are always in control of your accounts –– with no vendor lock-in. 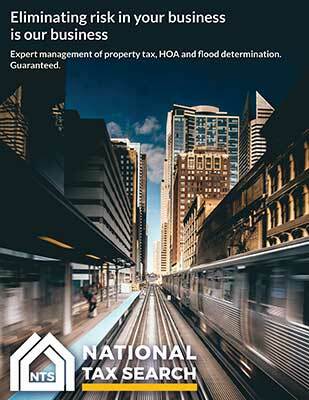 We bring proven commercial and residential real estate tax expertise and apply real-world knowledge to reducing your property tax risk. 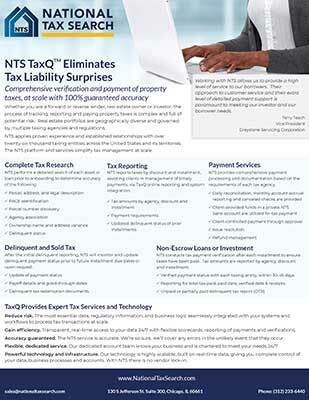 TaxQ, built on NTS Platform, supports the way you do business with real-time access to complete current, delinquent, and sold tax reporting. Our efficient tax payment processing, support for in-depth valuation analysis and tax appeal services saves you time and resources. We’re so confident in our system that the risk is on us. We back up our services with a 100% accuracy guarantee. Our comprehensive research is based on all essential tax data variables. For clients with a large number of assets, we can efficiently review current asset status, research loans or assets with upcoming due dates, and manage any files that may come in during portfolio boarding. Our best practices eliminate any potential exposure due to timing of boarding existing portfolios. Once onboarded, clients retain access to data in our closed-loop system, meaning that there is no expensive and difficult-to-manage vendor lockup. Due Diligence is a bundle of current, delinquent, and sold tax reporting designed to help our clients identify the potential risk of all assets. The Due Diligence bundle provides a clear risk assessment for just one property or an entire portfolio. NTS researches the property, reports all outstanding taxes and identifies due dates efficiently, so our clients can make informed business decisions. NTS provides a “One Time” detailed search of a parcel or asset returning detailed property tax payment information in as soon as 24 hours. The detail provided includes address, parcel or legal description review, agency validation, previous delinquent or sold status (see details listed under Delinquent & Sold reporting), current assessed and market values, and tax payment history along with notification of exemptions, abatements, special taxes. Certificate fees can be stated at the bottom of the certificate for use at closing. Documents and payment stubs for taxes coming due within 30 days are included with the certificate for use in making payment at closing Individual certificates can be ordered online through TaxQCert or customers with large volumes through TaxQ via batch ordering. With Tax Monitoring Service also known as Payment Validation Service, NTS will follow-up on all parcels after each tax due date to ensure that taxes were paid timely. Depending on the completion of the Agency’s payment posting, reporting is sent to you no later than 45 days and includes the original amount due, amount paid, over payment or shortages, original due date and date paid. If we discover the taxes were not paid or partially paid, NTS will report the amount unpaid, penalty and/or interest assessed and payoff date by way of NTS Delinquent Reporting (DTR). NTS can increase the bottom line by handling all Special Tax Research, including Tax Exemptions or Abatements for an Asset or Loan to ensure existing exemption programs in place are maintained. NTS will provide clients with information regarding frequency required to update or re-file required documents for tax exemptions and all necessary documentation. You can also use TaxQ as a place to file all of this information for future reference plus monitor exemptions by dollar amount received upon reporting property tax liabilities. With our Property Tax Projection solution, historic market and assessed values, tax rates and payments are gathered to assist our clients with the estimated or projected tax amount. Tax Projections allows you to budget for coming taxes and make strategic decisions for the coming year. NTS will obtain all documents, as you need them, to process through the entire tax cycle, from assessment notices, to tax bill and tax receipts. After NTS obtains these documents from the various tax offices, all documents are then scanned to TaxQ, giving you immediate access to view these important documents. NTS reports all current taxes coming due including tax amount, discount amounts, due dates, assessed value, and required payment details, no later than 10 business days prior to each Economic Loss Date (ELD). A Current Tax Report or CTR is the who, what, when, where, and how of current taxes. CTRs can be reviewed and printed or they can be downloaded as part of automation in our Automated Tax Report File (ATRF). Either way, you receive your current tax data timely and accurately every time. After you receive a detailed reporting please look into our Payment Services to make payments and reduce risk. NTS specializes in delinquent tax reporting service; providing accurate and detailed delinquent tax information. Whether the taxes are paid to the treasurer’s office or the clerk, NTS will tell you how much to pay, where to pay them, and documents needed for a successful delinquent tax payment. If the taxes can’t be paid at the first reporting, NTS assists you with planning for the future with the Next Critical Action and Next Critical Date. Along with all this information and the redemption period, NTS provides you the entire picture of what the status is on your property. PACE loans hidden in your porfolio can represent unplanned liability. Our comprehensive PACE research allows you to mitigate hidden PACE risk before it becomes a problem. NTS wil research all parcels provided to determine if a PACE loan exists. NTS will work with lenders to provide PACE payoff amounts when available. In addition, NTS ongoing reporting services include PACE special assessments and payment activity, delivered upon tax installment duedate, for each agency. Sold taxes are the most challenging to understand. 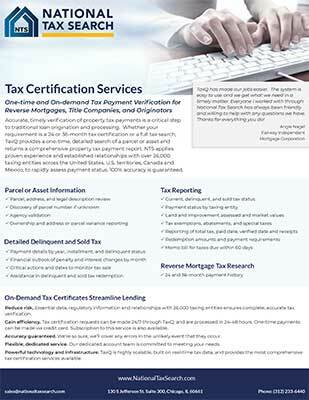 NTS has the experience to navigate 3rd party buyers and tax sales. In addition to the breakout of base tax amount, penalties, and interest, NTS identifies who the Tax Buyer is, when the estimated loss of property is, and if subsequent tax years are included in the sale. Similar to the Delinquent Tax Report, a STR tells you how much to pay, where to pay it, and what additional instructions or documents need to be followed before making the payment. NTS provides the most flexible way to pay taxes to tax authorities and keeping in compliance ensuring payments are posted timely and accurately. Whether this is via check, ACH, certified funds or federal wire transfer, NTS can do it all directly from an account established just for you. With NTS taking the responsibility of making your payments, the liability of added tax penalties and interest has been removed. All of the payment documents and records are available, at any time, on TaxQ. In the event NTS receives a refund check from a tax office due to a payment made on your behalf, NTS will research the refund, provide a reason for that refund and will return the funds. Subsequently, each month is reconciled against the bank account and any outstanding items are addressed to ensure that your funds are allocated properly. With the Payment Validation Service, also called Non-Escrow Service, NTS will follow-up on all parcels within 45 days of each tax due date to ensure that the taxes were paid timely and report any amount due, the due date, the date paid and the paid amount. If we discover taxes were not paid or paid incorrectly, we report all amounts through a Delinquent Tax Report. Also part of this validation service, NTS will update any outstanding taxes due and provide the next good through date.